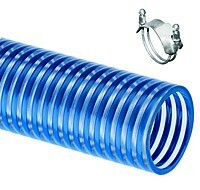 Kuriyama - BW Blue Water Multi-Purpose Low Temperature Suction and Transfer Hose - 3 in. X 100 ft. - OD: 3.43 in. • HMW PVC clear construction - allows for visual confirmation that material is flowing. • HMW PVC body - provides sub zero flexibility ... increased abrasion-resistance compared to standard PVC. • Smooth cover - makes clamping easy. Convoluted cover on 5" & 6" for greater flexibility. • Clear body with blue helix - provides easy identification.